On Sale Now! 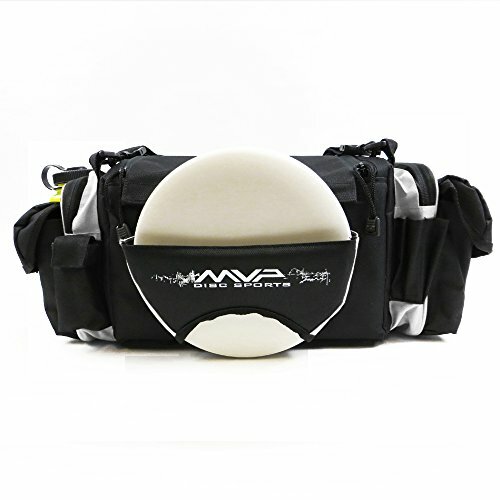 Save 5% on the MVP Disc Sports MVP Nucleus Tournament Disc Golf Bag - White by MVP Disc Sports at Scruffs Game. MPN: MVP-BAG-NUCLEUS-WHITE. Hurry! Limited time offer. Offer valid only while supplies last. Holds 18-22 discs (including 2 in front putter pocket). Black primary fabric with bold color accents (lime, pink, White, royal, or yellow). Holds 18-22 discs (including 2 in front putter pocket). Black primary fabric with bold color accents (lime, pink, White, royal, or yellow). Attachments available for included shoulder strap, or for MVP Back Straps. Rigid padded bottom. Rigid and thickly padded walls. 2 Insulated drink holders. Screen printed accented MVP bar logo. 2 Internal velcro dividers. 4 Ball feet to keep off ground and extend the life of the bottom. 2 Full size zippeWhite side compartments. 2 Quick access side pouches (great for a few minis, phone, keys, etc.). Adjustable shoulder strap included. Pencil holder next to putter pocket. Small utility pocket next to putter pocket. ZippeWhite pouch inside of the zippeWhite side compartment. High quality materials and craftsmanship. Discs and bottles are NOT included. DISCS AND BOTTLE ARE NOT INCLUDED. View More In Bags & Accessories. If you have any questions about this product by MVP Disc Sports, contact us by completing and submitting the form below. If you are looking for a specif part number, please include it with your message.